Mountain biking is the best sport in the world – there’s really no argument. The reasons are many: it’s a thrill, a challenge, a passion and great therapy. I think I speak for many in the mountain bike community when I say we’d struggle without our bikes. As much as the sport has done for us, there’s no denying there’s a major barrier to entry that we’ve accepted as a necessary evil. I’m talking about the growing financial cost. As our bikes and equipment become ever more complex and high performing, prices don’t hesitate to keep pace. So what’s my point? I’m afraid we’re excluding more and more kids and families from experiencing the freedom that only mountain bikes can provide. Enter Trips For Kids, a San Francisco based international charity with 85 branches including one based in Vancouver. Their mission is to use bicycles as a vehicle for lessons in confidence building, achievement, health, fitness and environmental awareness through the development of practical skills and the simple act of having fun. This is the 16th summer Trips For Kids Vancouver has been taking kids for rides on the North Shore and neighbouring networks, and it’s the first summer that rides are being offered to local kids in Squamish. 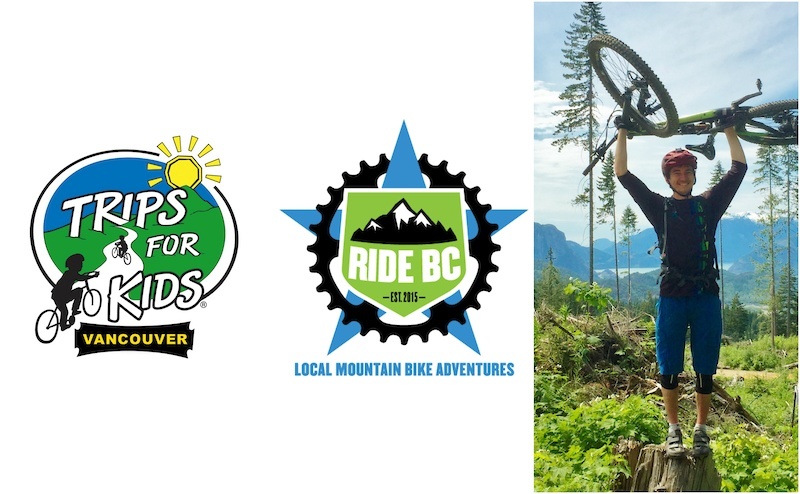 This is also the first year of a strong partnership between Trips For Kids and Ride BC, a Squamish mountain bike guiding company! For the remainder of the 2016 season, 100% of Ride BC profit will go directly to Trips For Kids. If you’ve ever dreamed riding the infamous Squamish trails like a local, Ride BC can make it happen. And you can shred with an even bigger smile knowing that your hard earned dollars are working to bring mountain biking to kids who wouldn’t otherwise get to experience the joy it brings. To book at a ride with Ride BC visit www.ridebc.ca, and for more information about the charity you’ll be directly supporting visit www.tfkvancouver.org. Well done. Biking has been so important in my life. And now I see that same passion in my 3 year old. He lives to ride trails already. I watch as his self confidence grows. He is so proud after he rides. I thank you for helping to introduce kids to our great sport. Nice James! Stoked to see some quality guiding coming through squam and good on you for giving back! We're super stoked to have James join our Board of Directors this year. It's really cool seeing things come full circle as he as actually a cousin of the the original TFK founder from 2001 who carried the torch of keeping TFK alive as a volunteer-run charity start up for the first decade. Great cause, great trails, and a great guy. Could my be a better combo for getting out and seeing what Squamish has to offer! James, you are a noble man. Kids are gonna be pumped. What if they're demanding long sustained slabs? Great cause and great guide!